In the history of trail running in the Alps, there isn’t an event that goes back much farther than Trail des Dents-du-Midi, held each September in the Valais town of Champéry. Recently, however, the race around the seven peaks has waxed and waned. Now, after a brief absence, a new coordinating committee is in place, and the event—now named DDM Trail—is back with renewed energy, new events and a bright future. We recently had a chance to talk with Organizing Committee Director Gil Caillet-Bois about the substantial improvements and additions to what is now nicknamed The Seven Summits Challenge. Run the Alps: Let’s start with the basics. The full 57 km race is back, as is the relay with the change of runners in Vérossaz. Are there any changes participants should know about for the main event? Gil: Not really. The renewal is respectful of the tradition! This is the will of the new committee: to value a unique and beautiful race, while bringing some innovations to improve the event, and, we hope, to make for a better experience all around! Run the Alps: There are two new kids races too, right? Can you tell us about those, and the goal behind adding those events? Gil: This is one of the innovations this year. It’s important to offer to the families of trail runners the opportunity to participate in the celebration. So, we’ve launched two different runs that will be organized just like the big events. Kids will finish their races through the magical crossing of the main street in Champéry! 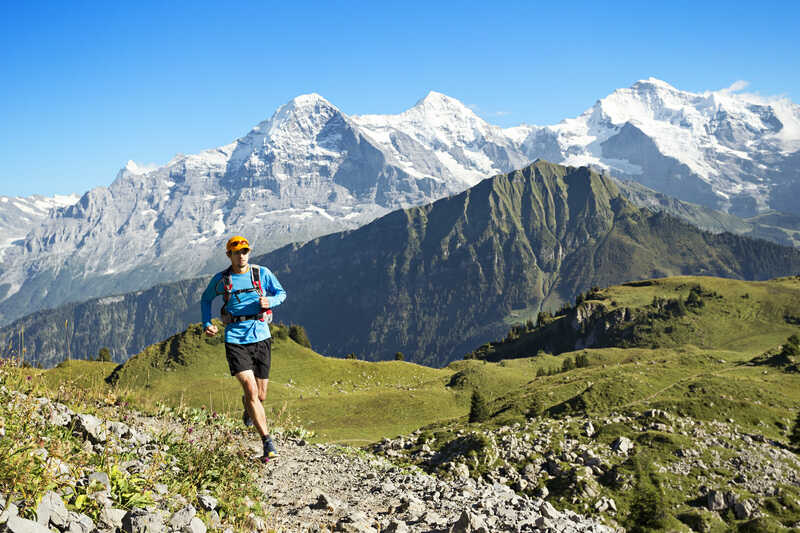 Run the Alps: That sounds like a fun time, and it should be great to watch. There’s another new event that sounds like fun, too—though a bit crazier. You just announced a race that involves running laps up the 1-km long, 331 meters of vertical Portes du Soleil “Chavanette,” or “Swiss Wall,” one of the steepest ski trails in the region. How does that work? Gil: We wanted to complete the activities of the weekend with something more like a fun run that would be accessible to more people—yet still in the spirit of the trail. The infamous Swiss Wall ranks in the top 10 of the world’s toughest ski slopes. From the summit of Chavanette, the slope plunges downward at a 37-degree angle. Thanks to the support of the Champéry ski club and the ski lift company, we are launching the summer edition of the Swiss Wall Challenge! It will be a team event. Runners and hikers will make the climb of the mythical wall of Chavanette and then take the chairlift down. The goal is to make as many loops as possible within four hours. There will be music, cheers and certainly some beers to drink to help the runners along! Run the Alps: We can’t talk about DDM Trail, without mentioning your special connection to the race. Can you tell us a bit about the role your father has played in the event over the years? Gil: Indeed, I have a special connection with this race since my dad participated in no fewer than 40 of the races! Ever since I was a kid I have run with him on the trails of the Dents-du-Midi range. When I was approached to participate in the organization of the race, I found it important to help, so that others could have the same experiences that I was fortunate to enjoy. Run the Alps: What’s the long-term goal for DDM Trail? Where do you see the event in five or ten years? Gil: Well, the first objective is to develop and sustain the race by remaining faithful to the values that have made it successful in the past: hospitality, authenticity and respect for the mountain. That’s important to us. Ultimately, we would like to extend the experience into a series activities and races over several days, for runners and also for their family and friends. The Chablais region and the Val-d’Illiez are such beautiful places, the possibilities are almost endless! Run the Alps: Gil, thanks for your time. Will we see you out on the course this summer? Gil: I hope so—if I can still find the time to prepare! I also hope to participate in the Montreux Trail Festival and the Swisspeaks Trail. Great interview. It looks like such a great race and i’d really like to give this a go. However, am having a problem getting beyond the fact that all the race “ambassadeurs” are male. I don’t how the ambassadeurs are chosen but is there something that can be done to even things up and include women too? Isn’t that what we should be striving for in the sport? Your comment is very important. The whole committee is working hard to bring in female athletes as ambassadors. I am pleased to announce the participation of Helen Blatter, former winner of the DDM trail, for this edition. And we continue to work to try to bring in more women.